The Greater Niagara Frontier Council (GNFC) will be holding one of its largest annual fundraising events, Fire and Ice, which will take place on Thursday, March 22nd at the Hotel at the Lafayette, 391 Washington Street Buffalo 14203, from 6pm to 9pm. Fire & Ice celebrates the Scouting experience and the positive impact Scouting has on our youth, their families, and scouting volunteers. The Chair for the event will once again be Eagle Scout and local car accident attorney, William Mattar. All proceeds of this event go directly to support our local Western New York Scouting programs. Last year’s record setting event raised over $80,000 dollars for Scouting. “It amazes me to see so many people in the Western New York Community come together to support Scouting. 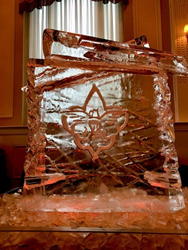 We are looking forward to continuing to build off last year’s momentum and raise even more support for Scouting in our local communities,” said Mattar. Tickets are $195 each or $375 per couple, and are available at http://www.wnyscouting.org/fire-and-ice. In addition, there are many sponsorships available for the event. To help everyone enjoy the evening safely, complimentary service from Designated Drivers of Buffalo will be available courtesy of William Mattar. Attendees will come together for an evening of music, themed food stations, cocktails and auctions, all set in a unique and exciting social atmosphere. “Every time I talk to people at the event who are attending for the first time, they always say to me how excited they are to come back next year. This truly is a unique and exciting event in Buffalo, and every year we are adding different features to make it even better than the year before,” said Mattar. Since the GNFC was founded over 100 years ago, tens of thousands of youth in our region have gone through their various Scouting programs. The Boy Scouts of America is the nation’s premier values-based youth development organization. The mission of the BSA is to prepare young people to make ethical and moral choices over their lifetimes by instilling in them the values of the Scout Oath and Law.